I respect Dr. Don Carson. And when the clever Canadian writes on matters I disagree with, I ask God for humility to change my position if his exegetical case is stronger than mine. Carson is not a cessationist—I am. 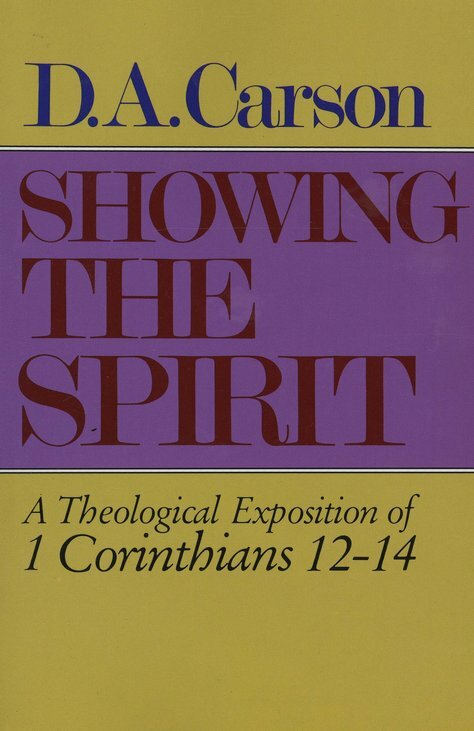 In this book, he addresses the key passage regarding tongues, prophecy, and other sign gifts. Would his arguments convince me? A Summary: Regarding spiritual gifts in general, Carson maintains in Showing the Spirit that charisma (translated “gifts” throughout 1 Cor. 12 except verse 1) is not a technical term that Paul uses only for supranormal gifts like healing and tongues. Rather, it can be used for encouraging, salvation (Rom. 6:23), celibacy (1 Cor. 7), and marriage. In this sense, every Christian is a charismatic and all unbelievers as well (since they have the “gift” of marriage or singleness) The term is broad. Regarding prophecy, Carson (along with oodles of Grudem quotes) defines it thus: “The reception and subsequent transmission of spontaneous, divinely originating revelation.” He then gives six reasons that the prophecy of the NT must be distinguished from the prophecy of the OT, especially in authority status. (1) Though modern prophecy comes from God, it may not be a direct quotation from God. That is, prophecies are not prefaced with “thus says the Lord” in the NT. (2) The legitimate heirs of the OT prophets were the apostles, not the prophets. In the OT, once a prophet was approved, people were bound to obey him. But in the NT, prophets are to have all of their content carefully weighed (14:29). (3) Prophets did not take over leadership of the church after the apostles died out. (4) The NT prophets have a very low profile. (5) Certain prophecies in the NT have less authority than OT prophecy, like Acts 21:4-11. (6) Prophecy is tamed in the NT, which is why Paul can encourage women to pray and prophesy in public (1 Cor. 11) but forbidding them to teach (1 Tim. 2) and evaluate content (1 Cor. 14:33-36). Regarding tongues (“a supernatural manifestation of the HS, whereby the believer speaks forth in a language he has never learned, and which he does not understand”), Carson asserts that nothing Paul says demands abolition of this gift. I found at least nine arguments Carson gives for the continued usage of tongues as seen in 1 Cor. 12-14. (1) Paul uses “yes-but” arguments throughout 1 Corinthians, stating exceptions regarding much of what he says. “Yes, you may have truth on your side to a point, but…” (e.g. 7:1; ch. 8). He does this in 14:5a, 18-19. (2) Though “tongues, they will cease” (1 Cor. 13:8) is in the middle, it doesn’t necessarily mean it will stop under its own power (e.g. the verb in the middle voice in Luke 8:24, not under its own power). The middle has a variety of meanings. (3) The “perfect” (13:10) is referring to the parousia, not Christian maturity or the completed canon. (4) Paul sides with the tongue speakers, saying we should not forbid it (14:39). (5) Though the tongues in Acts 2 were real, known, human languages, there are some differences those tongues and that of 1 Corinthians 12-14. (6) Paul thanks God that he speaks in tongues more than the rest, thus identifying with the charismatics. (7) 1 Corinthians 14:18 is the strongest defense for the private use of tongues. (8) Carson’s interpretation of the difficult passage in 14:21-25 is that sometimes tongues are a positive sign (e.g. Acts 2) and sometimes they are a negative sign (this passage). (9) Tongues still have limits (14:27). 1 Corinthians 11:5 apparently allowed women to prophecy in the church.” This is a hard verse for Cessationists to answer because we define prophecy as preaching or forth telling divine revelation, yet Paul does not rebuke the woman who is prophesying in this passage–as he apparently does in 1 Timothy 2:12. I’ve read several cessationist commentaries that ignore the implications of this verse. Regarding the evidence, I must acknowledge that the exegetical strength for the cessation of tongues is not very strong. I’m still don’t see how the gift of prophecy (as defined by Carson) does not in fact leave the canon of Scripture open. Carson’s section on this (“Reflections on Revelation”) was confusing. Why is it that the majority of books attacking the Prosperity Gospel, faith healers, and the chaos in charismaticism are written by cessationists? Where is the continuationist version of Charismatic Chaos? Carson could have come down hard on the Pastor Teargas Miracle Crusade and his ilk, but he didn’t. Are the tongues a real, known language in 1 Corinthians 14 or are they not? It was unclear. Charismatics too quickly dismiss the aberrations of tongues. Carson gives the example of a man who went to a Charismatic church and quoted John 1:1-18 in Greek. The interpretation had nothing to do with the verses. He said this doesn’t disprove tongues but calls for“reflective pauses”. What exactly does “prophesying” and “interpreting” look like in the local church? Carson never showed us but a peek into such a church service would have been helpful. Carson and Grudem aver that some NT prophets were inaccurate on the details, like Agabus in Acts 21:4-11, thus strengthening their case the NT prophets are not equal to the OT version. But a better interpretation is probably that Ababus was accurate and that Paul was most likely bound originally by the Jews, perhaps even with his own belt. Then the Romans came along and rescued him by binding him with chains. This is among the strongest defenses of the Charismatic/Continuationist position on the sign gifts. Carson gave several strong arguments (especially regarding tongues) and recognized how difficult numerous passages are to interpret. This gave me greater patience with Reformed Charismatics but not with the Prosperity crowd. Overall, however, I was not convinced by the charismatic position. Thanks for the review! I myself am a former cessationist turned continuationist. I don’t know if you have read Grudem’s “The Gift of Prophesy.” Although his work exclusively deals with prophesy, I found it to be helpful. I am curious about how you might interpret the phrase in Chapter 1:10 of the 1689 Confession that reads “private spirits”? Or, is there any specific portion(s) of the confession that either explicitly or implicitly teach cessationism? Great questions and comments, Lucas. Thanks. I would take 1:10 to mean that inward inclinations or convictions that people may have (be they be called “prophecies”) should be judged by the Scriptures. But both sides would agree with that. My question is, if Judd stands up in church and says: “Brothers, I just have a word from the Lord. Sally should take that job in Tulsa she’s been praying about”, how can that be judged by the Scriptures? If it is a word from the Lord, then it is infallible, if it is not, he’s a false prophet–at least at that moment–correct? I have read some of Grudem’s work on prophecy. How would you answer my critique of Carson/Grudem on Ababus’ “error” on details? Re: #6 i might take issue with “probably” (…a better interpretation is probably that Ababus was accurate…). Having a reputation of being historically accurate and extreme attention to details I find it odd Luke would leave it out. But I do find your hypothesis interesting. I guess we only really know what was recorded. Also, if you’re looking for examples of how prophesy works(ed) in the church and reformed baptists, I know Charles Spurgeon had some prophetic moments. I’ll try to find a source. And I know Vincent Cheung wrote a couple brief articles that were interesting. I’ll try to find them. It’s unfortunate that Spurgeon had to create a new term “impression” to describe what looks/sounds like prophesy. If we are all charismatics in one sense, then they are also cessationists in a more important sense. First, they believe the gift of apostle has ceased. If there are no apostles today, then there is a cessation of New Testament norms in a very important sense. On what basis can this discontinuity be explainedwithout also opening the door to the cessation of other activity in the book of Acts? Second, tongues, which they define in a two-fold sense, is half done since missionaries now have to study laboriously to evangelize. Third, gifts of healing are at the very least greatly diminished. Where isthe Reformed Charismatic who claims to have the gift of healing, or even who knows someone who does? I mean, Acts 3 style? Show us a modern example of Jesus receiving everyone in the village and healing THEM ALL. Where does Carson discuss these–and other kinds–of ways that we are all cessationists? All excellent points. On number two, perhaps they’d say not all HAD the gift of tongues, nor do all HAVE them today, like so many missionaries. But we’d come back and say: show us ANY missionaries who have this gift.